Nagios Log Server™ is a powerful enterprise-class log monitoring and management application that allows organizations to quickly and easily view, sort, and configure logs from any source on any given network. Ease of Use: Nagios Log Server greatly simplifies the process of searching your log data. Set up alerts to notify you when potential threats arise, or simply filter your data to quickly audit your system. With Log Server, you get all of your data in one location, with high availability and failover built right in. Quickly monitor your servers with configuration wizards and start monitoring your logs in minutes. Infinite Scalability: Log Server is infinitely scalable, so as your organization grows you can easily add additional Log Server Instances to your monitoring cluster. This allows you to quicly add more power, speed, storage, and reliability to your overall monitoring system. Nagios Log Server is designed for organizations of any size and can adapt with the click of a button. Your Data in Real Time: Viewing your log data within the context of time is the most important thing about monitoring. Log Server allows you to view log data in realtime, providing the ability to quickly analyze and solve problems as they occur. This keeps your organization safe, secure, and running smoothly. Adaptability: Nagios Log Server has a fully accessible API allowing for complete customization to fit the needs of your network. Integrate it with third-party solutions for seamless integration with your current infrastructure. Network Security: LogServer is a premier solution that's perfectly designed for security and network auditing. Easily create alerts from the web-interface based on queries and thresholds most important to you. Notify users via Nagios XI / Nagios Core, email, SNMP traps, Nagios Reactor Event Chains or execute a script to ensure quick problem resolution. 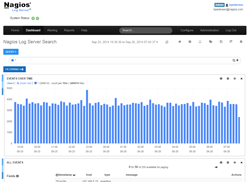 Log Server lets you dive into the issue to help you find a solution. Advanced User Management: Multi-User capabilities allow IT teams to work together efficiently. Admins can add, modify, and remove users, as well as set access permissions so users can only modify changes to their own profile. Admins can also grant specified users access to the external API via an access key. Customizable Dashboards: Users can create custom dashboards in the web-interface to see quick views of data most important to them. Users can also easily share dashboards with a custom URL to enhance team collaboration. Network Insights: Nagios Log Server provides users with advanced awareness of their infrastructure. Dive deep into network events, logs, and performance standards. Use Log Server to provide the evidence necessary to track down security threats, and quickly resolve vulnerabilities with built-in alerts and notifications.